You see roses everywhere for St Valentine's Day. So paint yourself some! It seems sometimes like Valentines are just for happy couples. So much pressure over one holiday! I feel like Valentine's is a time to treat yourself and anyone you love. The weather has been dreary for months, but we can just see bulbs thinking about spring. It's cold and wet, but winter is almost over. So treat yourself! Buy some gorgeous flowers (roses optional) and paint them. 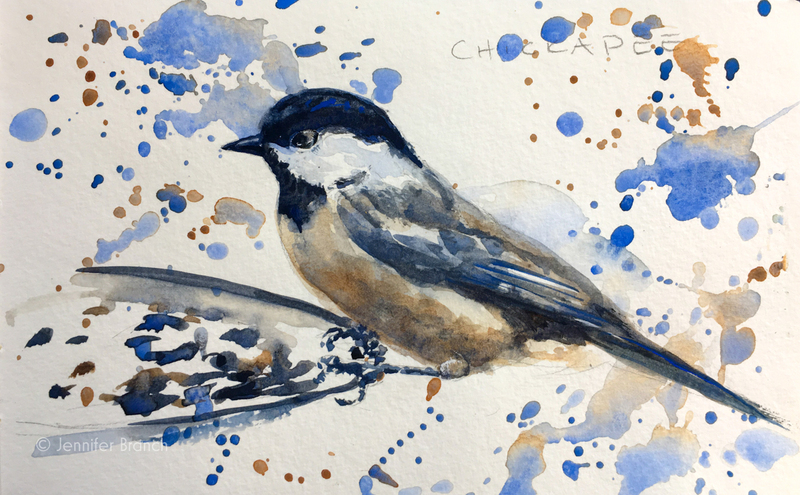 Take a few hours to think about the promise of spring and put it in a painting. Maybe you can give it to someone you love! 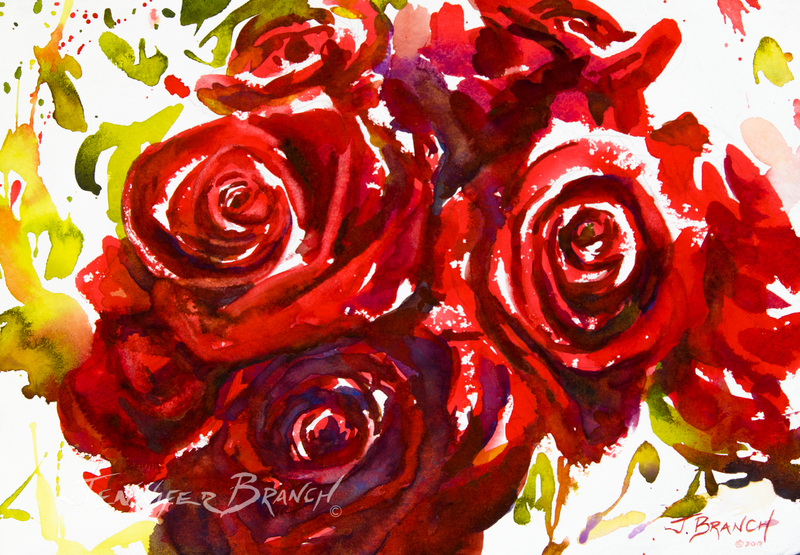 I haven't painted red roses in a while, so I did several sketches of my flowers. Here is one. I began by sketching the petals in a fairly detailed (for me) fashion. I wanted to keep all the white highlights that I need. Too much white gouache would probably spoil the richness of the color. 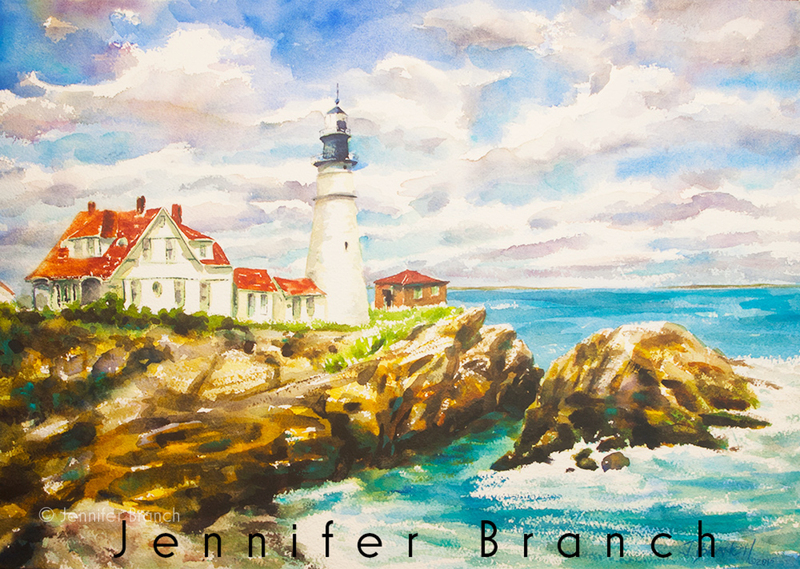 I'm using Pyrrol Red extensively in this painting. I actually started using it for this painting since none of my other reds were the rich red pigment I needed. It's a very bright, but not too orange, pigment. I'm using a saturated brush, just dry enough for hit and miss strokes. 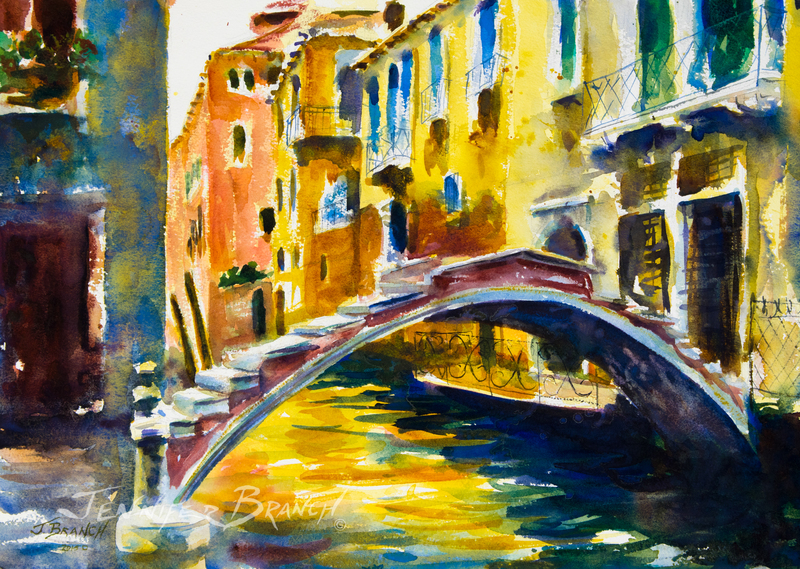 I continue around the painting with the same slightly dry, saturated stroke. I'm relying on my pencil sketch quite a bit. I leave a lot of white paper, mostly painting the darker shadowed areas. A little bit of green, mixed with nickel azo yellow and viridian green, contrasts against the red petals and makes them seem much brighter. Leave lots of white paper. It's easy to paint over it at the end, but impossible to get back! Some cobalt violet dulls shadow areas enough to give depth to the flowers. I'm carefully not painting highlights and brighter reds. I don't want to dull those! A little bit of the greens pulled into the flowers dulls the reds, but is almost luminous as well. I start refining details with some crisper lines at the centers of the flowers. A few more shadows really give the rose bouquet some depth. I refine a few of the awkwardly shaped petals. I'm still using a lot of Pyrrol Red, shaping the edges. 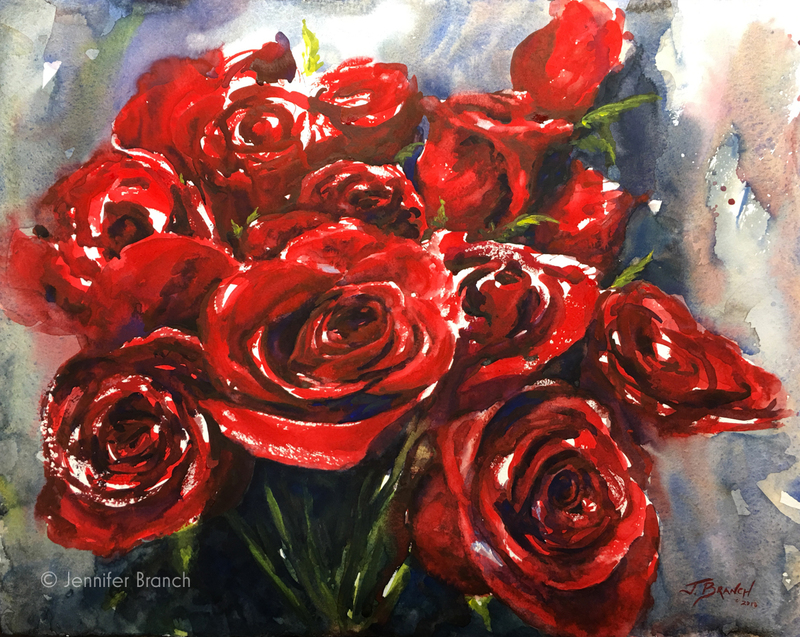 To purchase Red Roses Painting Tutorial original watercolor painting, please click! Red Roses Painting Tutorial Final Watercolor Painting! Here's the final painting! I love the immediacy of this little painting. It's very casual looking, just a few strokes, not many layers. What most viewers don't realize are the simple paintings take the most preparation. Since all the brush strokes matter, none of the brush strokes can be off. I did about 10 sketches of my gorgeous roses before this one and the painting still took 2 tries. Two tries for a painting is fairly good odds for me so not a big deal. I then took everything I learned and put it into my next painting. Since this roses painting has already sold, I think I learned a great deal about painting roses! My point (I do have one!) is don't worry if your first painting isn't exactly how you want it to be. There's a lot that goes into a simple little painting behind the scenes. Even if I show you every step of a painting in a video, you're not going to see my sketching several times - sometimes over the course of years. You're not seeing my planning a brush stroke. When it's finally time to paint the real painting, it looks and feels almost like magic. But the part you don't see was a lot of hard work and mess ups. It's totally worth the effort, so don't get discouraged! The process is a lot of fun! It's a lot like relationships, really. The simple ones are usually the best. But they took a lot of effort to get to that point. I hope that you enjoy some flowers this Valentine's Day - and paint them!